Slate roofing has its origins all the way back in the 13th century. Many of us are familiar with it from photographs of old mansions or beautiful estates in the French Alps. But lately, slate roofing has been making a comeback on top of far more conventional homes. If you’d like to learn more about the elegant choice of roofing, keep reading for the ins and outs of slate roofing. Let’s begin with the basics. Slate is just a type of stone. It has a high degree of mica content, which causes slate to take on different hues of color depending on how the light hits it. In fact, that’s one of its most identifiable characteristics as a roofing medium. The mica content that causes this effect can make up as much as 40% of the roofing material. The short answer is slate is absolutely gorgeous. It comes in a wide range of colors, too. You can choose from green, gray, black, red, purples, and tiles that include several varieties, all at once. Furthermore, they also come in a wide range of styles too. 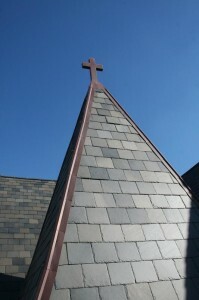 But slate is more than just a great looking choice for roofing. The material is practically unrivaled when it comes to durability. In fact, so long as it’s properly constructed, it’s not unrealistic to expect your slate roof to last up to 150 years. Obviously, that’s longer than any of us needs it to last, but it’s something to consider if you’re looking to buy a home with a slate roof. That’s not all, either. Unlike just about every other option on the market, slate roofing is fire resistant. In fact, the tiles themselves are actually fireproof. That’s especially important when you consider how many home fires start due to airborne elements like sparks from nearby house fires, wildfires, or even fireworks. Roofing practices result in literally tons of waste every single year. In fact, over 5% of the garbage that gets sent to landfills each year in this country comes just from roofing. Most of this is the type attributable to the asphalt shingle variety. As this option needs to be replaced every 20 or 30 years, it’s easy to understand how positive an effect something like slate could have due to its longevity. 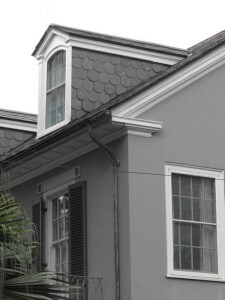 No roofing option is perfect, and that includes slate. So, there are a couple of potential downsides that you’ll want to consider before choosing it for your home. First, slate roofing will cost more to install than just about any of your alternatives. This is understandable, however, when you consider all of its advantages. However, when you think about the fact that it will last at least five times as long as any of your other options, this disadvantage becomes less glaring. Secondly, slate roofing isn’t something every contractor is experienced with. This is often one of the elements that add to the option’s price. You’ll want to make sure that you only hire a contractor who has experience with slate roofing, too. Otherwise it will be very easy to incur extra costs, either right away or down the line, due to poor installation. If you can stomach these minor drawbacks, though, you’ll be quite happy with your choice of slate roofing. Your home will immediately have better curbside appeal that makes for a memorable first impression, too. And the choice of colors and textures means that you can choose the look that’s right for you. Of course, you’ll also save money over the long term and be doing our environment a great service.